The jewels used in watches are usually rubies, sapphires (which are chemically the same as rubies), garnets and diamonds. After around 1900, most of the rubies used were synthetic. Before 1900, the jewels were either from stones that were too small or had too many flaws to be used in jewelry. In either case, they really weren't that costly. There is often a correlation between the price of the watch and number of jewels, but the jewels themselves are not the cause of this higher price. 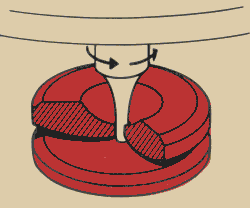 Reducing friction is an extremely important goal in watchmaking. Jewels have two important properties that help reduce friction. First, they can be made to be very smooth, and therefore they let the metal parts slide easily. Secondly, they are very hard and therefore don't wear down very quickly. 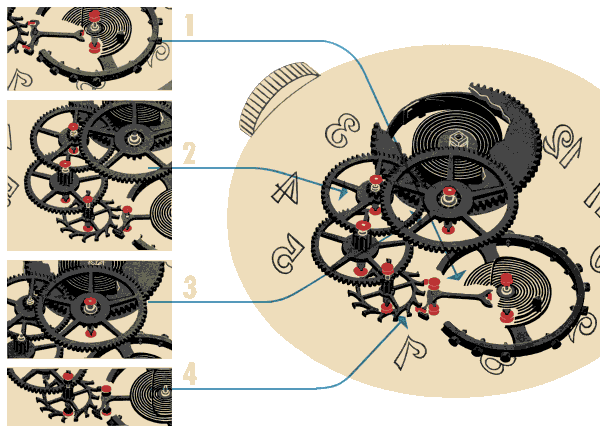 The gears in a watch are carefully designed so that the teeth roll on each other, rather than sliding. 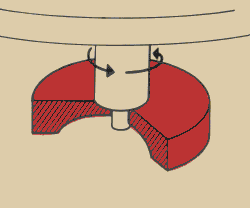 If the axle of a gear wears away the hole that it sit in, the gear will shift. That means the teeth will no longer roll on each other and therefore friction will be increased. Hole Jewels: These are donut shaped jewels that fit over the gear axles (in watch lingo, the wheel arbors). Cap Jewels: These are flat jewels that are placed on the ends of the axles (arbors). Pallet Jewels: These are brick shaped jewels on the pallet fork that alternately engage and release the escape wheel. 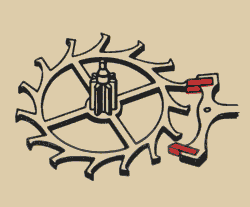 The escape wheel is the gear with funny "boot" shaped teeth. Roller Jewel: This jewel is on the large balance wheel that swings back and forth. It engages with the pallet fork on the end opposite of the pallet jewels. The jewels are carefully shaped so that the capillary action of the oil causes the oil to be drawn toward the gear arbors instead of spreading out where it doesn't do any good. The basic 7 jewels are part of the escapement and balance and are found on all Elgin watches. They include cap and hole jewels for both the top and the bottom of the balance wheel (total of 4), the two pallet jewels and the roller jewel. The next 8, making 15 jewels, are hole jewels for the fast moving part of the gear train. The next 2, making 17 jewels, are jewels on the center wheel. The next 2-4, making 19-21 jewels, are cap jewels on the escape wheel and the pallet fork. Some watches, mostly pocket watches, the mainspring barrel will be jeweled. 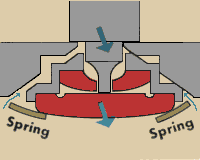 In order to safely jewel the mainspring barrel, the watch needs to have a "motor barrel" instead of the more common "going barrel". 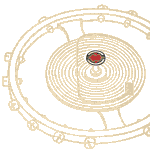 (See the the Watch Mainspring Barrels web page for more information.) This can bring the jewel count up to 23 jewels, which is the maximum you will normally see on a pocket watch. Additional jewels are often needed to make automatically wound watches efficiently transfer the small amount of power generated by moving your wrist into the power needed to wind your watch. More jewels are often used for chronograph functions, time repeater chimes, and date/date displays. Very complicated watches can have over 40 functional jewels. In a shock resistant watch the jewels that carry the heavy balance staff are mounted in springs. The springs take up shock and help prevent breakage of the either the jewels or the tiny balance staff tips. If the shock is large enough, the thicker parts of the balance staff will knock up against the plate that the jewels are mounted on. While this will cause the watch to stop ticking for a split second, it also prevent any damage, even in extreme cases. The kind of shock protection pictured here is called "Incabloc" and was invented in the mid 1930's. 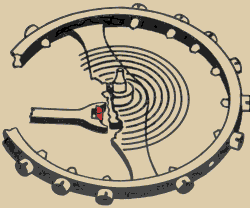 The first form of shock protection was invented by Breguet in the late 1700s. As mentioned above, the jewels themselves are not that expensive, but watches with more jewels tend to be the higher grade and more expensive. The general public, over the years, have associated lots of jewels with high quality and some manufactures have taken advantage of this false connection to fool people by adding non-functional jewels. On a 7 jewel watch, the only jewel that can easily be seen is the cap jewel on the top of the balance staff. When additional jewels are added, you normally can only see half of them as the other half of the jewels are hidden under the watch dial. Some watch companies, including Elgin, would jewel only the end of the wheel arbors that was visible, thus making the watch appear to be higher grade than it really was. Some Elgin documentation claims that 80% of the cost of a watch is labor. There is certainly some additional labor involved in creating the additional parts needed to hold additional jewels and to place the jewels in the watch. However most of the additional labor needed to create a high grade watch is from making sure that the watch has the consistency needed to adjust the watch to high tolerances. Additional jewels can make it easier to get this consistency. One of the downsides of jewels is that they break much easier than metal bushings. Most watches made before the mid 1890s had a maximum of 15 jewels, even the highest grade railroad watches. "Over Jeweling" a watch was thought to make the watch less rugged so it was considered, especially by the Swiss, that jeweling the center wheel to bring the watch up from 15 jewels to 17 jewels was not necessary. The center wheel does not need to be jeweled to reduce friction because it moves so slowly. 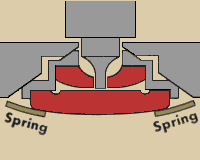 Since the center wheel arbor sticks through to the dial side of the watch and drives the gears that moves the hands, the bottom jewel is especially easily broken. A highly jeweled watch will usually not wear out as quickly as a watch that doesn't use jewels but, again, jewels are not required to make a very accurate and high grade watch. Jewels are added to make it easier to create a high grade watch, but adding jewels alone will not make a watch high grade and many high grade watches do not have lots of jewels. Rob Berkavicius has written up an excellent article called 83 Jewels Too Many?. It goes it more details about various ways that watch companies have added non-functional jewels to watches in order to make their watches appear to be higher quality than they really are. This web site runs on 100% Open Source Software. This web page was last changed on 11/27/2002 at 23:54:37.